Wood. It makes up so much of our homes, from the framing to the flooring we walk on. And it appears in all kinds of furnishings, too. But despite its prevalence, the wood in our homes is mostly covered by drywall or plaster, and then paint or wallpaper on top of that. This is a real shame. 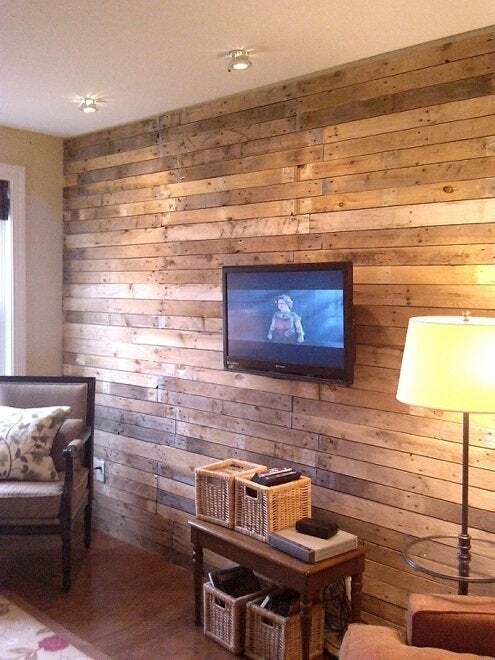 Wood brings so much character, warmth, and natural beauty to interiors that it should be the finished wall treatment. The effect is part cabin and part library, and it’s all DIY-doable. Single mom Katy (a.k.a. 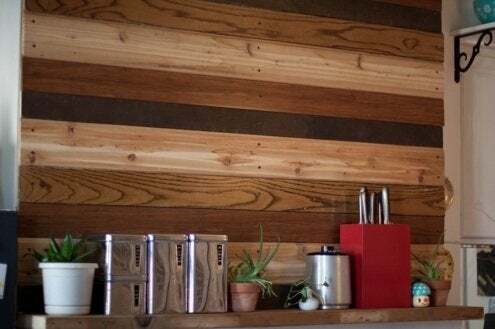 Mom and Her Drill) installed this amazing wood wall feature, using free wood from upcycled shipping pallets. And the best part? Her pallets came from a local factory and were guaranteed not to have any harsh or unhealthy chemical treatments. See how she did it. 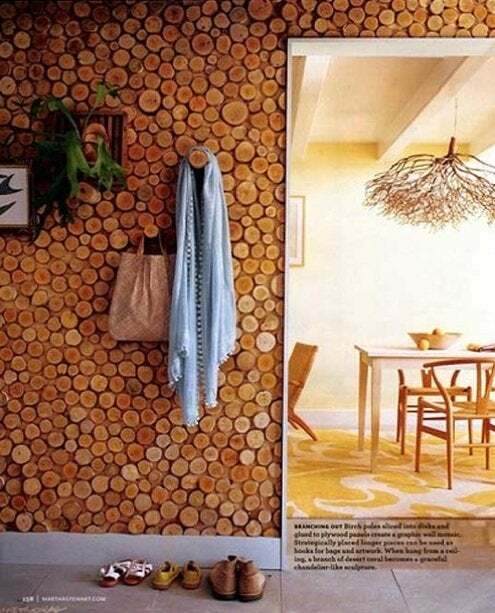 My buddy Matt of Wood & Faulk recently completed this subtle wood wall in his dining room. 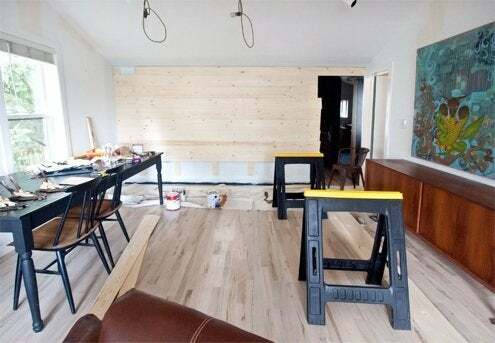 With several coats of OSMO-brand finish in a translucent white, this relatively inexpensive accent wall warms up Matt’s dining room like nothing else could. Learn more here. My friend Meg, an actress and crafter living in a small NYC apartment, didn’t have many options when it came to personalizing her rented space. So she came up with this great way to use reclaimed wood to recreate the original ‘hearth’ look of her pre-war apartment kitchen—all for very, very little money. Check out the video of her DIY effort on Curbly. If you really want the look of a wood wall, consider this raw branch and limb project from the staff of Martha Stewart Living. Slices of birch poles are attached to the wall and projecting sections become integrated hooks for hanging storage. 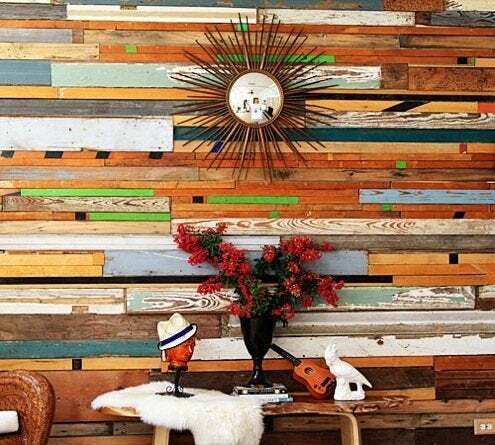 And if you’re really ready to make the commitment, this bold and contemporary solution (by Sarah at Design*Sponge) used all recycled wood and was completed in a mere eight hours for only $130. That’s a lot of bang for your DIY buck. Click here for an overview of the process.